Some IBM i applications do not particularly lend themselves to being monitored easily; causing Administrators to have to write and run queries that highlight whether key files contain certain values. These values often equate to an internal application process being in an incorrect status - potentially causing more sinister problems further up the food chain. 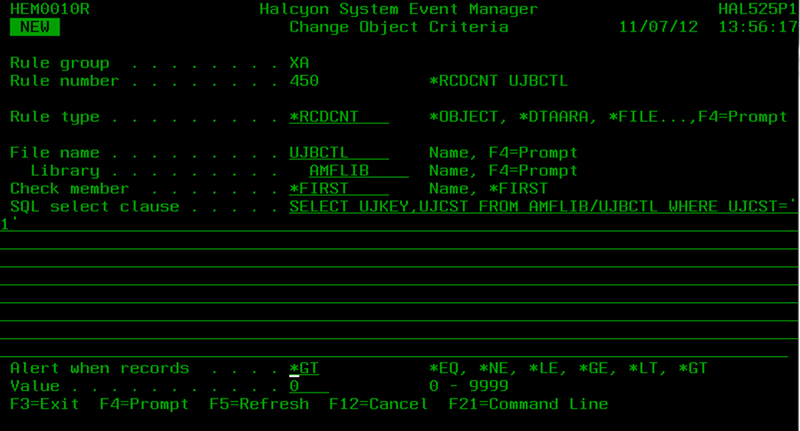 Halcyon Software has developed an enhancement to our popular Object Monitor that allows you to “look inside” a physical file to check whether a defined field has a specific value in it. Let’s take a look at a sample file. In this file I’m interested in the “U-job Control Key” and the “U-job Current Status” fields. And I’m only concerned if there is a “1” in the U-job Current Status field. Any other values do not concern me. Running queries to check this status is very time consuming and not a particularly efficient use of time. Using Halcyon’s Object Monitor you can setup a simple rule that runs a SQL statement, at intervals defined by the Administrator, to alert if one of the fields matches our defined alert criteria. In our example the rule is looking for the value “1” being in field UJCST (U-job Current Status). Based on this rule you can raise an alert in various forms, including the Enterprise Console, where you can see both a summary and the detail behind the alert. This is shown below where the U-job Control Key name is AMBS1. Some of the other forms in which you can see the alert include; email, SMS or remotely via an app on your Apple or Android Smart Phone or Tablet.